Are we wealthy? 7 forms of wealth! Have you heard about rich people who are not happy at times? Do you know about those people who have a very good job, they are earning well but complaining that they are not happy? Who is a wealthy person? Do you think that a person is wealthy when he or she has lots and lots of money? I think there is more to wealth than money only. We all are wealthy in one way or the other. Really – Believe me! In my view, a wealthy person is always happy. Why? How can we distinguish big thinkers from small thinkers? By listening to their vocabulary and words they use. Listen to people around you and concentrate on the words they are using. Just try ‘listening to others’ for one day and will help us to understand that positive people use positive words. Big thinkers are specialists in creating positive, forward-looking, optimistic pictures in their own minds and the mind of others. We have read many stories about successful people in the world – Scientists, Artists, sports people, businessmen or any one else – What are the key areas which all people have to learn before they become successful? Is it some magical word or is it some habit? People become successful when they learn how to handle three things. 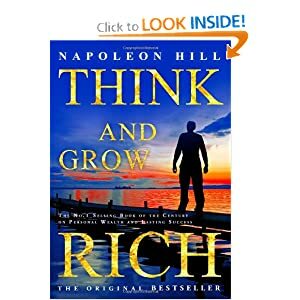 Think and grow rich – a six step plan to become rich! I always thought that a person should work hard, earn more and grow rich. However, Napoleon Hill suggests that first, change your thinking if you want to earn money and become rich. Once ‘organized thinking’ is cultivated, achievement of the goal to beome rich turns easier! Do you believe this? Generally it is considered that being rich means being wealthy i.e. having lots of money. However, in the all time best-selling book: Think and grow rich, Mr. Hill has advocated that all the blessings of almighty including our ability to work, a sense of happiness, joy, peace of mind, strength, courage, wisdom and of course money – all are ‘riches’ and hence, one can achieve richness by ‘thinking’ first and then working towards them. Think and grow rich is the book which took 25 years in making! On increasing income – Why does Madonna earn more than a heart surgeon? If Madonna sings and record an album on one hand and a great heart surgeon work for three hours on one patient, who is going to earn more? Self made millionaires always exceed expectations. There are three kinds of people at work: Those who meet expectation, those who exceed expectation and those who do just what they are told to do. People who exceed expectations add value to any organization wherever they work.